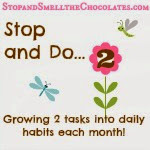 Stop and Smell the Chocolates: WFMW: Backwards Edition ~ Blogging Purpose? WFMW: Backwards Edition ~ Blogging Purpose? I was thinking about actually posting a WFMW tip today, but then I saw that it's the backward edition! That means you get to post a question and ask your friends for input - I love that! So I don't have a question about household kind of stuff (well I suppose I have many, but who's really gonna answer if I say "Who wants to come clean my house for me? "), but rather a blogging question. It's not even a technical one that's easy to answer. It came to mind as soon as I started thinking of a question. I just recently read something interesting in 31 Days To Clean by my friend Sarah Mae. She said, "You need to have purpose in what you're doing, you need vision, or you will continue to stay in a rut." Sarah Mae was talking about a vision for keeping your home, but this really applies to most things in life, don't you think? That includes blogging! Right now I feel like I'm in a kind of bloggy limbo without purpose or vision. And that probably partially explains my lack of posts. I don't know what to say or do anymore after taking time away from my blog. The good thing is that blogging doesn't have the hold on me that it did previously. The bad thing is that I lost my vision. Yes, it's my personal blog and I can blog about whatever I want, but WHAT do I want to say - LOL! I know that I'm the only one who can figure out my own purpose and vision, but I would love some input from you! Maybe some of your thoughts, ideas, opinions will spark something in this foggy brain of mine! If you blog, what's the purpose of your blog? How did you come up with your vision? Do any thoughts come to mind when you stop by my blog? Did you think I already had a clear purpose/vision? 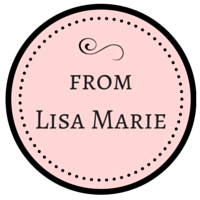 Whether you have a blog or not, I welcome all of your thoughts on the subject! And if you're in the same boat as me, maybe we'll find new ideas together! Thank you friends!! 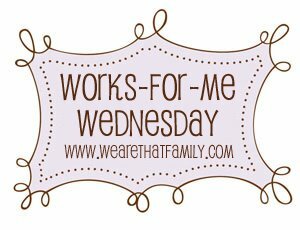 Stop by WFMW at We Are THAT Family to answer more questions and find great tips! Hi! I came over from WFMW. Your blog is beautiful!! I went through this phase, too. It lasted over a year for me, and I think I posted twice during that time! For me, getting over it was just about getting back in the saddle. 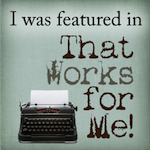 My blog muscles had atrophied, so to speak, and I was waaaaay out of practice. Plus, it was about getting over wondering whether or not I was doing it right. Did people even want to read what I had to say? What was I doing?? I finally just started writing what I wanted to write. I joined up with a few carnivals, just as a jumping off point and to get some inspiration. My recommendation is to just jump on it. 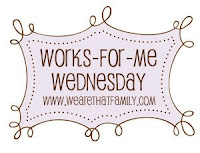 Make yourself a goal - mine is to put up one post every weekday, at a minimum, and two on certain days. Then, write what makes you happy!! Each post doesn't have to be a heavenly bastion of perfection. It just needs to be about you and the things that are important to you. That's a tough question right there. You know I've always loved your blog no matter what you posted but I think that's because I know you and care about your content. It's hard to believe that my blog started out very serious and devotional like. When I finally gave up and let the professionals take care of that, I was a lot better off. So I concentrated on doing what I do best and that's making people smile. So my blog has become one that people can stop by and hopefully leave with a smile. There are to many serious and informational blogs out there but not to many that just want to bring giggles and grins. I understand that my posts probably don't bring the readership of those that give things away ALL THE TIME or have link ups or are sponsored by people but that's okay. It's the people that I've grown to know that keeps me going. Since we've moved more out in the country I actually feel like I've earned my blog title and I am actually a bit more inspired. You probably couldn't tell but it's there. For you I would say do what you feel comes naturally. I know that you have a wonderful sense of humor and wit as well. Use that in whatever you write. Just blog about life no matter if it seems silly or not. Remember my baking soda post? LOL! That got more comments then just about any other. Ha! Whatever you decide I'm gonna be right here. Just don't quit. Big inspiration needs chocolate to fuel itself so down some Hershey's Kisses and start blogging size hugs to you! I know that if I didn't have a purpose and at least one scheduled blog post a week (Monday Musings) I would never blog. The purpose of my blog is mainly to keep our extended family updated with our family's happenings....they never comment but I know they read it because the Monday I missed because I had the flu, my dad and sister both called me that night to see why I had missed my post! Interspersed with my own thoughts and that is the extent of it for now. I decided my blogging purpose is to have a place to vent my craftiness and kid photos (that I love to take, but am not very good at) so I don't drive Mr. SD crazy with my craziness. I am sure I will change this 'purpose' at least six times this week, LOL! I've definitely not been as focused on my blogging in the past year as before. My purpose? Great question! I enjoy just having my own space on the web to let it all out, and I enjoy writing too. I think my biggest purpose though is just to have a place to record life. I enjoy going back and reading about the kiddos first day at school, birthday parties, holidays, etc. It's kind of a whole life scrapbook and I don't have to buy all the little stampers, paper, and other cutesy things! I'm glad your back by the way!! !